Growing up, the closest I ever got to a haunted house was watching episodes of Scooby Doo on Saturday morning cartoons. 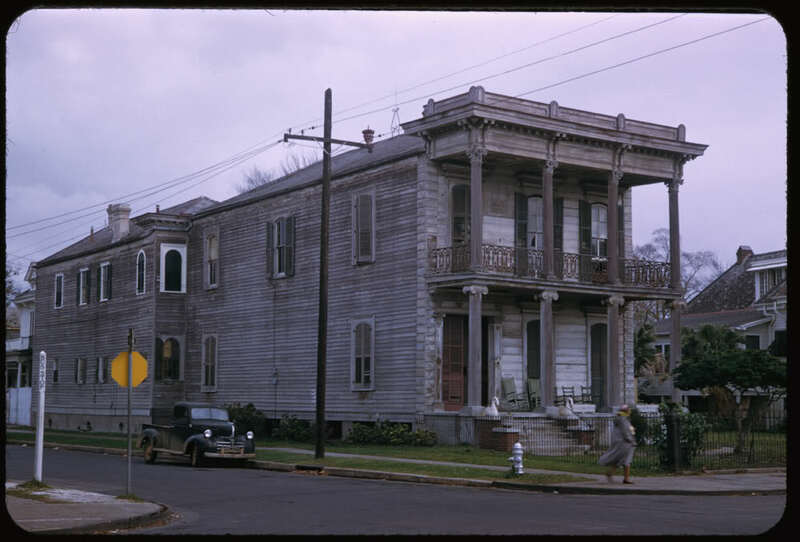 As a teenager, I visited facsimiles of haunted houses, made purely for Halloween profit. But insofar as I’ve never seen a ghost, I don’t believe in them, nor haunted house. 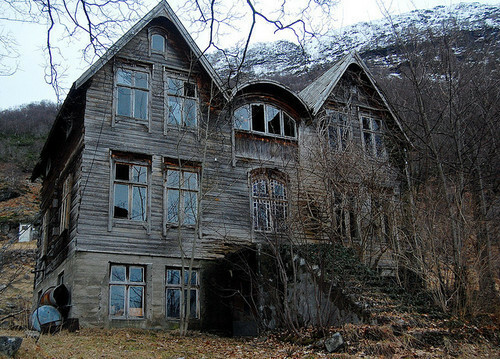 But if by chance, they do exist, I imagine they reside in spooky homes like this, with broken windows and dilapidated porches with rusted railings. 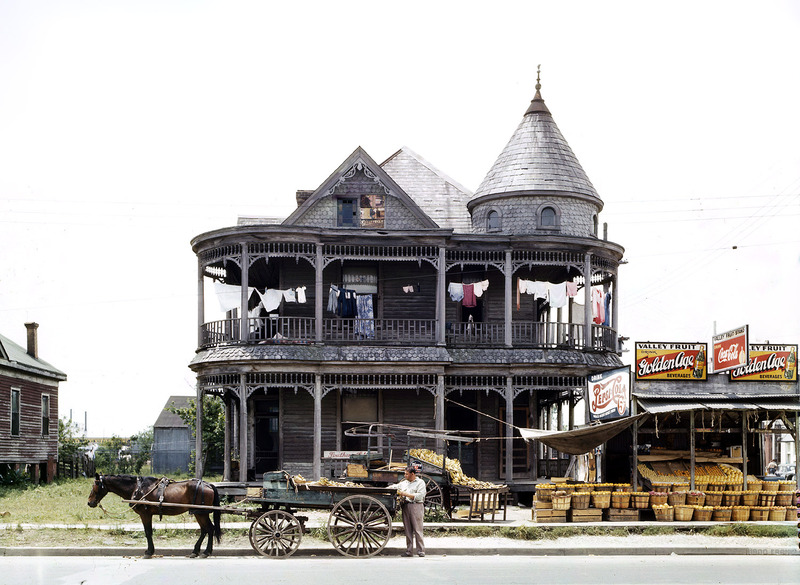 This old Victorian mansion may appear innocent enough, with a fruit stand out front, and laundry blowing in the breeze. But you know there are some kidnapping milk carton victims trapped in that upper bedroom. Don’t you see their fingerprints on the panes? You actually can see the child in the lower left portion of this tenement housing, so it’s a given those curtains upstairs are concealing various abducted persons. The ones out front are just a cover. This plantation house is creepy even in brightest sunlight. 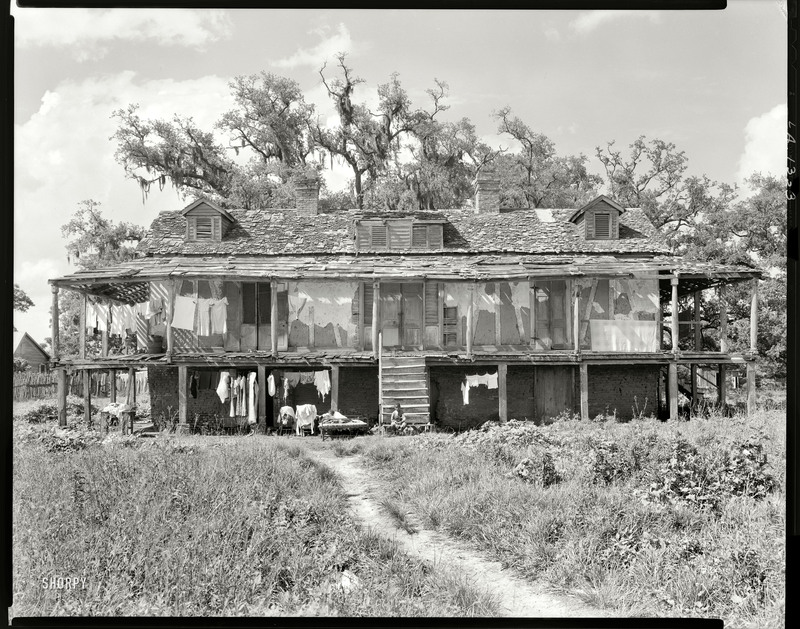 No doubt the ghosts of former slaves are flying amongst the rotting shingles and crumbling chimneys. 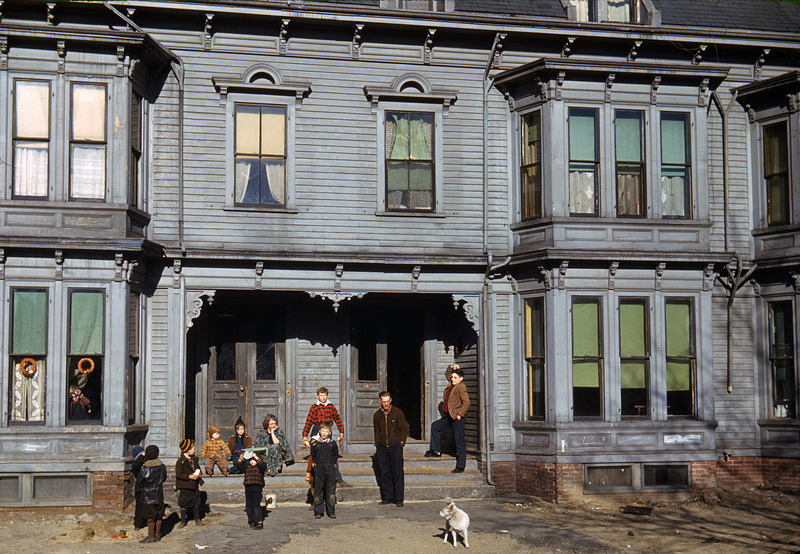 The boy sitting on the stoop is merely an apparition. 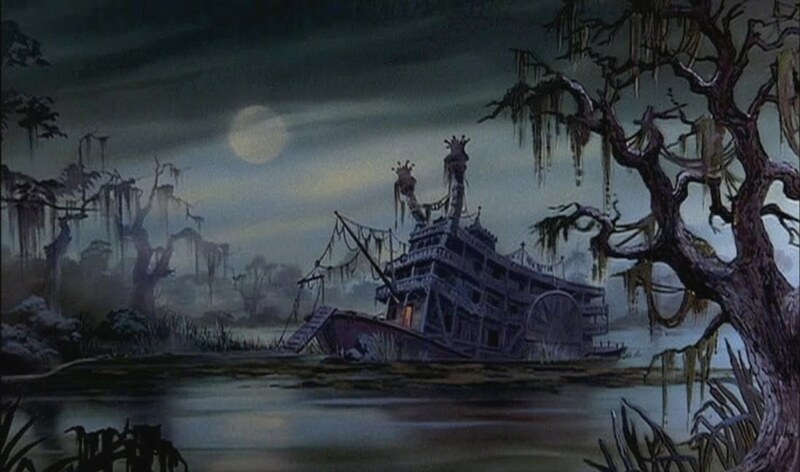 This one looks more like a movie set, like the swamp scene in The Rescuers. But this one gives me the williest of willies. It’s not the broken windows nor decaying wood; it’s the fact that it appears to be tucked into a hillside, maybe in the recesses of some mountain community, where subspecies and dialects exist that you and I know nothing of. I bet it looked fine in its glory days, but it’s time for the wrecking ball. Make room for suburbia! Yeah, I’m pretty sure all of these are haunted. But really, once I die, someone needs to remind me to pick a NICE place to haunt. I mean, I know they’re dead, but who wants to live in a place like that? Pick a five-star hotel, at least. Maybe once you’re a ghost and you’re too stubborn to join the rest of the folks in the afterlife, your perception of fine living is distorted? I imagine Four Seasons have Ghostbusters on standby, should any swanky phantoms try to haunt the deluxe suites. Are you making fun of all my childhood homes? How dare you! I’m the polar opposite here. I LOVE creepy places in general. I have an unusual fascination with trying to scare myself and these places certainly help with the process! You of ALL people should know the risk of cardiac arrest you face, should a ghoul or goblin come flying at you in some falling-apart old shanty. since I have a tendency to view 90-100% of everything through the comedic lens I think these locations would fit quite nicely as the back drop to a sitcom about a grown up Haley Joel Osment who (of course) sees dead people and is a real estate agent that caters to their “special” spiritual needs. Only to be constantly harassed by a wise cracking, trouble making dead uncle played by (you guessed it) Bruce willis. I am thinking the title “Sixth Century 21” would fit best. This is genius! You need to pitch this to a functioning network that can offer Bruce a salary close to Ashton Kutcher’s in 2 1/2 Men. I’d rather watch your show anyway. Would the uncle also be a little randy, like Beetlejuice was dead but still liked the ladies? The second photo reminds me of some of the pictures in the WPA “Bound for Glory” color Depression era collection. Those photos are mesmerizing. 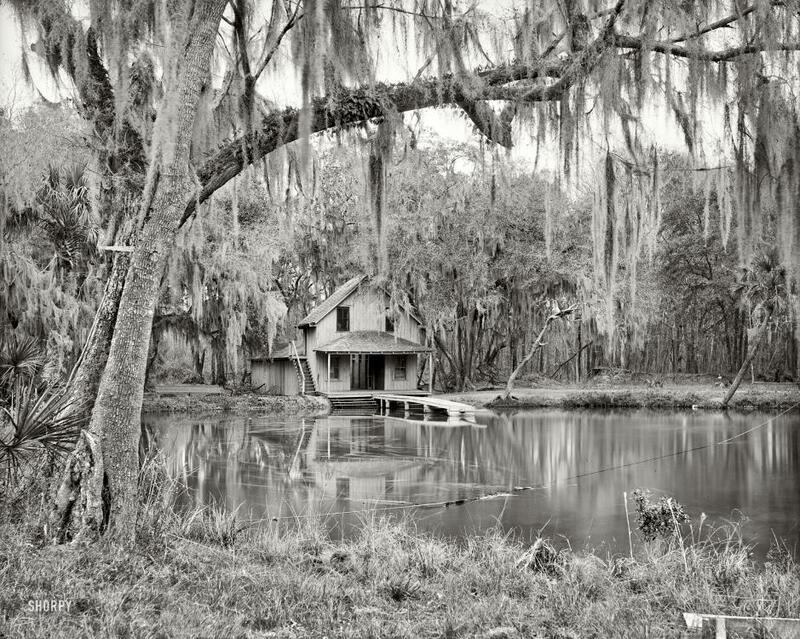 I love old houses, haunted or not. There was one up the street from me when I was like 5, and we all called it the Spooky House. I guess I hadn’t yet come into my own in the creative naming things department. Also I love Shorpy. Shorpy love right here. Right? Couldn’t you spend days on end on Shorpy? I used to think spooky houses were cool, but now I can just imagine the roof caving in on me, and suddenly I have tetanus. Poor lamb. Actually that tenement photo IS from the WPA collection. I’m so smart. Sorta. I am applauding you and giving you mad props for knowing that.